Update: After the delighted feedback I changed my rating from an unfortunate 1 star back to the 5 this app deserves. Thank you. I used this app since March 2014, and the latest patch completely ruined this app as a reliable sleep monitor as the button for Snooze and Stop are now right next to each other. This causes you to accidentally turn off the recording and thus stopping the Snooze cycle if you accidentally press the wrong one. Before the buttons were on opposite ends of the screen and you had to press and hold the Stop button for about 3 seconds which made it almost impossible to end by accident. When submitting an issue I was told just turn off the recording before the alarm goes off because then you still have to hold the button for 3 seconds. Which makes absolutely no sense as what's the point of an alarm then? Also, when the sleep recording is active, the standard iPhone alarms are disabled. New update: We just released a new update (version 11.1) that lets you turn this feature back on. To enable this, launch the App, then go to Settings > Sleep Settings to turn on 3 second hold to stop. Thank you for using Sleeptracker 24/7 and please email us at support@sleeptracker.com if you have any questions or feedback. 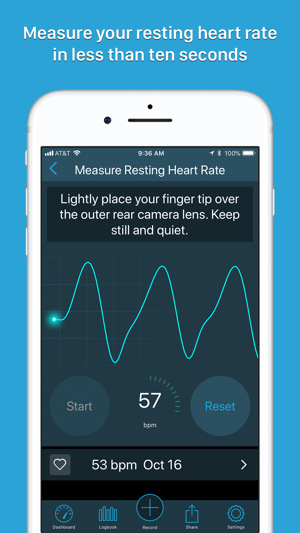 Prior response: Thank you for your feedback and for being a long time user of Sleeptracker 24/7! We will bring back the 3 second 'hold to stop' as an option in the next app update. The reason for the button moving to the bottom of the screen was user feedback that the button at the top of the page was hard to press when using the iPhone with a single hand. The reason the 3 second hold was removed on that stop button on the alarm screen was feedback from users that it was frustrating not to be able to immediately silence the alarm as it would wake up others. We will make the 3 second hold to stop a settings option in the next update so that you can enable this again. I apologize for the inconvenience. 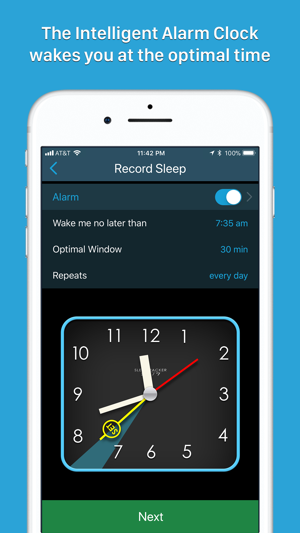 We cannot reproduce any issue with Sleeptracker 24/7 interfering with your standard iPhone alarms. 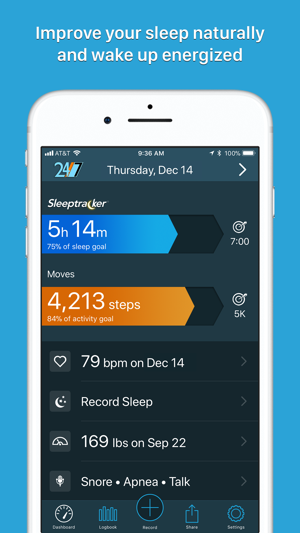 Can you please send us any additional detail by email to Support@Sleeptracker.com ? I was going to give the app 4 stars but when I factored in how responsive support is, the overall breadth of the apps capabilities as a general health tracker, etc... I decided to give it 5 stars. I bought the app years ago and it remains one of my favorite trackers. Update: still a fantastic app... the fact I can track so many factors set it apart from other sleep trackers. If I had one suggestion it would be to integrate iPhone sensors so you could accurately track sleep without having to place phone on bed or wear it. The only app I've seen that does this and manages to remain accurate is sleep cycle. 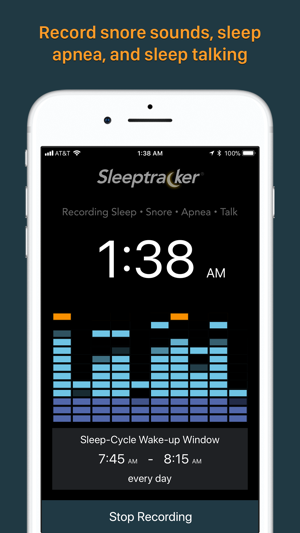 If Sleeptracker could somehow utilize same technology it would blow all other sleep tracking apps away. That said, it's still my favorite all around health and sleep tracker and I love the coach features to keep you active. Thank you for using 24/7 and the kind comments about our support team! Please reach out to us if you have any questions. Update: Issue has been fixed. Snooze button is right next to sleep button now, and sleep button no longer requires 3-second hold. In my groggy awakening state, I have accidentally hit Sleep rather than Snooze three times now. Luckily my dogs wake me up looking for their breakfast, otherwise I would have been much later to work. 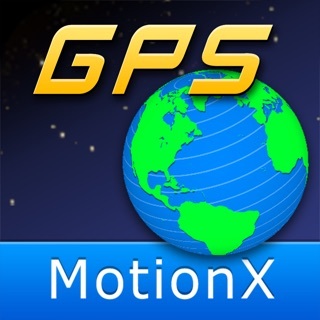 I love this app otherwise, always have, I've used it for years. 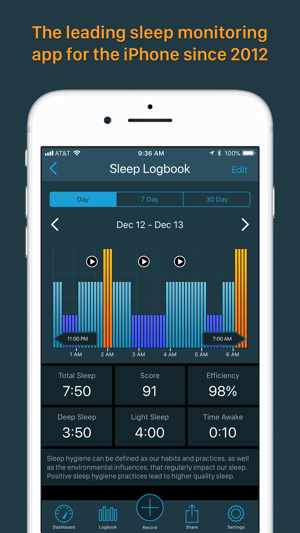 I read the previous review about the 3-second sleep hold coming back in a future rev, and will change this review to the 5-star review this app normally deserves once that happens. I can't be late to work again. We just released a new update (version 11.1) that lets you turn this feature back on. To enable this, launch the App, then go to Settings > Sleep Settings to turn on 3 second hold to stop. Thank you for using Sleeptracker 24/7 and please email us at support@sleeptracker.com if you have any questions or feedback.